Hampton Bay ceiling fans are designed to circulate air within a room to help provide a more comfortable environment. The fans can rotate in either direction to circulate air in different patterns, producing either a cooling or warming effect. Some models of Hampton Bay fans use a remote control device that adjusts operating times, temperatures, speed and rotation direction. Changing the direction of a remotely controlled Hampton Bay fan is a simple procedure that takes just seconds to accomplish. Turn the fan on by pressing the "auto" button or the "lo," "med" or "hi" buttons on the remote control, depending on the type of unit. Press the button marked "reverse" or "for/rev" on the remote control to reverse the rotation of the fan. 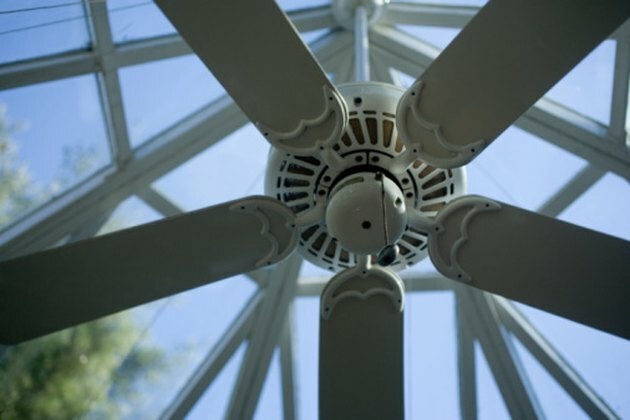 Set the rotation to a counterclockwise rotation in warm weather for a cooling effect or a clockwise rotation in cooler weather for a warming effect. How Do I Clean My Cyclone by Lasko Fan?